The West Maui Hospital Foundation and Fleetwood’s on Front St. are working together to bring healthcare to the West Side. Click here to learn more! are bringing Quality Healthcare to the West Maui Community! WMHMC had its groundbreaking ceremony on August 15, 2016 and is targeting late 2019 to be open to serve the public at its 25-bed Hospital, which will include a 24 hour Emergency Room. The WMHMC will also include a 40 bed Skilled Nursing Facility and 40 unit Assisted Living Facility. The West Maui Hospital and Medical Center campus is designed to be a fully integrated healthcare services provider to meet the basic health and safety needs of the 65,000+ people of who live, work and visit West Maui. WMHMC will be built on 14.99 acres of land that was purchased from Kaanapali Land Management Corporation in September 2014. The campus is situated on Kaka'alaneo Road just below the Kaanapali Coffee Farms Development. 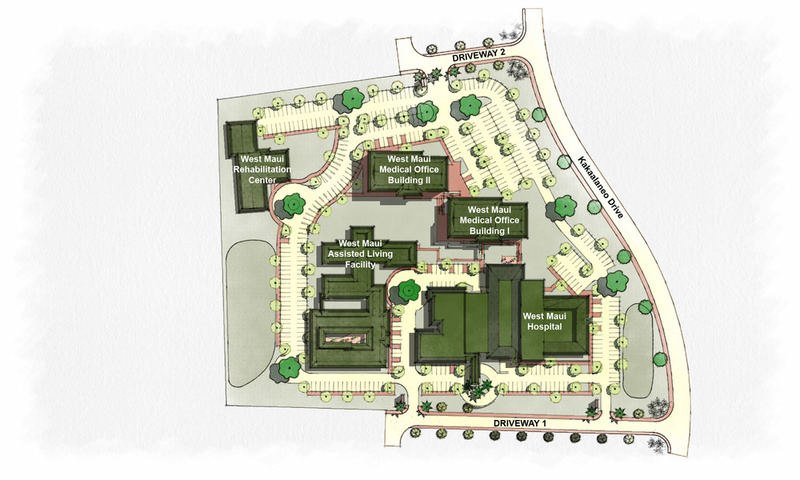 The centrally located campus will maximize timely access to quality access healthcare to all of West Maui. The primary service area for the campus is within the 96761 and 96767 Lahaina zip codes. This area encompasses the extreme northwest corner of the island of Maui. This area is medically isolated from the one acute care facility on the island and there is no medical facility in West Maui that accepts ambulance patients at any time, day or night.